Since the baseline of MRC CFAS there has been an increase in life expectancy, changes in major chronic disease and potentially advances in symptomatic treatments for Alzheimer’s disease and other dementias. Increasingly, MRC CFAS was asked to answer questions about generational change in dementia, cognition and life expectancy states by the government and the public, which lead to the daughter study, Cognitive Function and Ageing Study II (CFAS II) funded by the MRC and the Alzheimer’s Society. CFAS II is based in England and builds upon the design and infrastructure of CFAS I. CFAS II recruitment began in 2008 and the study provides data on generational and geographical differences, including people in institutions. 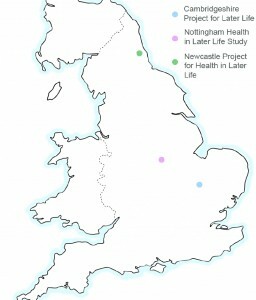 It also provides important baseline information on older people aged 65-84 in 2008-2011 who will reach the age of greatest frailty during the 2020’s, when the peak in the number of people aged 85 or over is expected and at a time when major therapeutic interventions for dementia could be expected to have an effect. CFAS II is comprised of 3 centres: Cambridgeshire, Newcastle and Nottingham. Data can be directly compared with the subset of MRC CFAS data known as CFAS I, which contains data collected at the identical three sites. Estimate the prevalence and incidence of cognitive impairment and dementia nearly 20 years after the first CFAS cohorts were established and to quantify differences seen between 1991-2 and 2008-2010. Investigate whether the measures that characterize the intermediate stage (Mild Cognitive Impairment) best within original CFAS are stable across generations. Measure population differences over time and to assess differences between urban and rural settings, and the new relationships between health, social factors and service receipt. Compare healthy active life expectancy over time for the whole group and within social groups and assess whether over the last 20 years educational and occupational social groups have experienced differential change and whether there has been a trade off between physical and mental health expectancy. CFAS II will update the evidence provided by CFAS I for policy purposes. CFAS II provided an opportunity to investigate the implications of changes in morbidity and frailty on health itself, as well as the use of services and expenditure in health and social care on future.